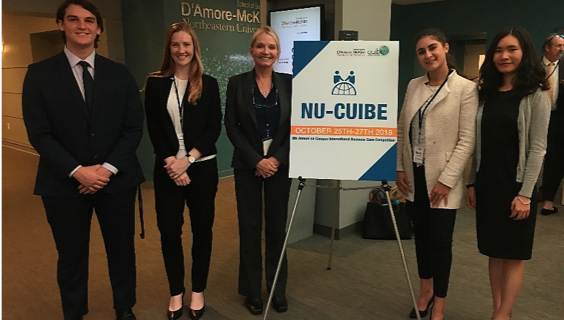 Each fall, the Ahlers Center for International Business sponsors a team of four students to represent the University of San Diego at the CUIBE International Business Case Competition hosted by Northeastern University in Boston, Massachusetts. This year, I had the distinct honor of being one of them. On Thursday, we walked twelve and a half miles. 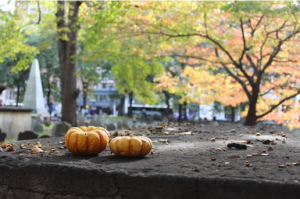 We started down the shady streets of Back Bay, admiring the Parisian-inspired architecture and the freshly-carved jack-o-lanterns that adorned every porch. 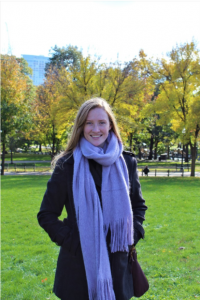 We made our way through the Boston Public Garden and Boston Common where we marveled at the chlorophyll breaking down all around us and questioned for a brief moment why we stayed out West for college. Around the corner we found Granary Burying Ground, a spooky cemetery in the heart of Boston that hosts the remains of those killed at the Boston Massacre in 1770, as well as Samuel Adams and Paul Revere. History continued to surround us as we navigated the narrow, cobblestone streets of the North End and eventually found ourselves at the location of the Boston Tea Party, near Long Wharf. By evening our legs were sore from our “half-marathon” but our minds were sharp. The nerves set in as we gathered with the other fifteen teams in the dining room of the Colonnade Hotel for the welcome dinner and address. 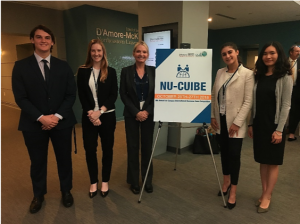 The representatives from CUIBE, the Consortium for Undergraduate International Business Education, select a case study for this annual competition that requires in-depth analysis of a company’s unique, complex, and internationally-rooted dilemma. The teams from participating universities do not receive access to the case study until the first night of the competition. Upon receipt of their copy of the case, the teams have exactly 24 hours to perform their analyses and draft a proposal detailing their solution to the challenge faced by the company. I pushed the last of my chocolate-covered dessert back and forth on my plate as the cases were passed to each team. Once we received our copy, we collected our coats, said goodbye to our advisor, Dr. McCoy, and the 24 hours began. The knot in my stomach started to twist as we waited for the elevator in the crowd of sweaty-palmed business students in their freshly-pressed blazers and slacks. The anxiety was palpable. The next 24 hours were somewhat of a blur. By 9:01 pm the next night, our eyes were bloodshot from lack of sleep, our limbs grew heavy as our adrenaline levels returned to normal, and the hotel room was littered with scratch paper and take-out boxes. But our proposal was done. Twelve hours later, we stood in front of a panel of industry professionals and presented our solution. The case described a dilemma faced by the head of Corporate Social Responsibility at Hilton Hotels. In recent months, the hospitality industry has faced significant public pressure to address the issue of human trafficking in hotels across the globe. While Hilton is dedicated to combating human trafficking at every level of their organization, the company recently underwent significant restructuring that left them with little control over their franchises, which now account for approximately 85% of their portfolio. Consequently, Hilton would not be able to require mandatory training for franchise employees to spot human trafficking in their establishments or require the use of approved vendors to reduce the possibility of forced labor occurring in their supply chain without restructuring their franchise agreements and taking on significant legal risk. To address this problem, our team developed a creative, two-pronged strategy that would incentivize franchisees to use Hilton-approved suppliers and train all employees using a standardized training module. Hilton would offer its franchisees a discount on supplies through its pre-approved vendors based on how many of their employees completed the training. 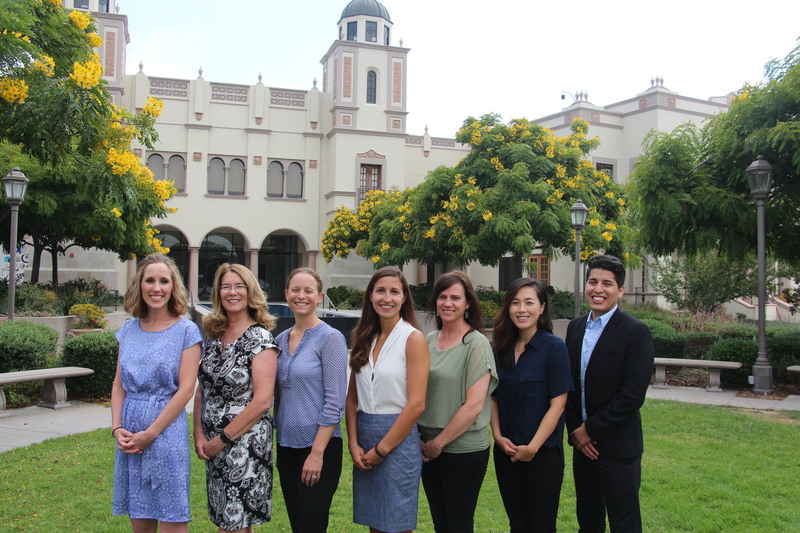 The CUIBE case competition provided me with some of the most hands-on learning I have ever participated in. My teammate Nicole said it best when we reflected on the experience in our post-competition debrief, “I think I’ve learned more in the past 48 hours than I have in my entire time as a business major.” This competition required the application of skills in every area of business, both in the dissection of the case and in the interaction among teammates. The case encompassed aspects of finance, strategy, business law, corporate social responsibility, public relations, and a variety of other disciplines. The 24-hour deadline allowed us to test our performance in these areas under pressure. It’s one thing to be able to work well with your teammates, analyze a difficult case, and present your findings to a panel of leading industry professionals in a reasonable period of time; It is completely another to achieve the same results under significant time constraints. 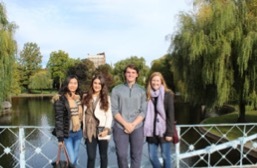 Fortunately, the opportunity to prove ourselves was one of the more rewarding aspects of the experience. 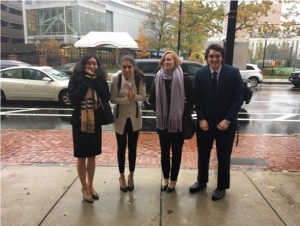 The pride we felt in ourselves and in one another after we gave our presentation contributed to a feeling of camaraderie that is all too rare, especially among students in competitive business programs. This experience has given me a valuable opportunity for professional and academic growth, and three people whom I can now call friends. This entry was posted in Ahlers Center Fellowship and tagged Ahlers Center, Ahlers Center for International Business, business class, CUIBE, CUIBE Case Competition, global awareness, global mindset, global trends, go international, international business, international experience, professional development, USD by Jack Desany. Bookmark the permalink.